U – Ulverstone: Tasmanian Light Horse Memorial. Welcome to Day 18 of the Blogging A-Z April Challenge. As you may already know, we’re Travelling Alphabetically around Tasmania. Much of the details and the photographs in this series, came from trip to Tasmania in January. This was a family holiday to show their kids where Daddy came from, but it also came to connect us with Geoff’s late father and his family ties throughout Northern Tasmania. Due to the alphabetical nature of this challenge, we have skipped some of Tasmania’s better known places and landmarks, and gone where the alphabet takes us. That is how we’ve ended up in U for Ulverstone today. Ulverstone is on the mouth of the Leven River, on Bass Strait 21 kilometres (13 mi) west of Devonport and 12 kilometres (7 mi) east of Penguin. Penguin, by the way, is where Geoff’s Dad was born and raised and it’s also where his mother died when he was only nine years old. So, we will be attending the dawn service in Ulverstone at the Cenotaph. It is quite apt that we’ve come to Ulverstone on ANZAC Day, as it is the site of the Tasmanian Light Horse Memorial. This acknowledges Ulverstone’s pivotal role in the formation of the Light Horse in Tasmania. With the advent of World War One the 12 LHR was renamed the 26th Australian Light Horse Regiment (26 LHR). This unit provided officers, men and equipment to form a Tasmanian Squadron for service in World War One.”C” Squadron was posted to the 3rd Australian Light Horse Regiment (3LHR) that was being raised in South Australia. This first AIF unit served for seven months at Gallipoli before joining the Australian Mounted Division in Palestine where they served with honour until 1918. The 3rd Australian Light Horse Regiment, including the Tasmanian “C” Squadron cleared and held the hills to the right of the line during the last great cavalry charge at Beersheba. Geoff’s Great Uncle, Major James Griffin, served in this C Squadron 3rd Regiment Light Horse, enlisting on the18th August, 1914. He was 24 years and 9 months old and a farmer from Dunorlan, near Deloraine. Later, his brother Daniel also joined the Light Horse. Both of these men returned, but so many did not. Such as Gunner Robert Ralph French, his Great Uncle of his Mum’s side, but still known throughout the family as “Nanna’s brother”. In WWII, two of Nanna’s sons served, thankfully both returned home but her nephew was Killed in Action. My thoughts and prayers today are for those who have lost someone close to them through war. Or, have also survived the aftermath of these horrors, after service people returned home with severe PTSD. Geoff’s aunt talked to me about how women were encouraged to help the men settle in back home and in a sense “re-civilise” them, which was mighty unfair leaving women and children at serious risk of emotional and physical harm, something which really has been swept under the carpet and is only starting to be addressed with our current generation of service people and much more needs to be done. This entry was posted in Australia, Blogging From A-Z April Challenge and tagged ANZAC, ANZAC Day, army, Australian Light Horse, Beersheba, death, Gallipoli, grief, Major James Griffin, Tasmania, Tasmanian Light Horse Memorial, Tassie, Ulverstone on April 25, 2017 by Rowena. 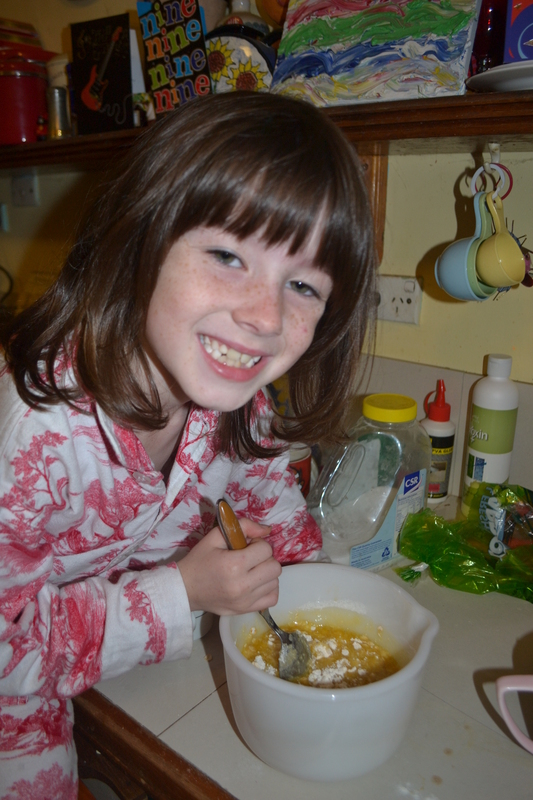 This entry was posted in Australia, Kids learn to Cook, Love, Parenting, Recipes and tagged ANZAC Biscuits, ANZAC Day, Australia, baking, biscuits, Gallipoli, recipes, war, WWI, WWII on April 25, 2016 by Rowena. This weekend I’d like to invite you around to join me for William Shakespeare’s 400 Death Day Party. Since I doubt Shakespeare was much of a coffee drinker, we’ll be having tea served in my Shelley tea cups with generous slabs of birthday cake…along with Tim Tams. No doubt Shakespeare would approve! For those of you not embroiled in the Blogging A-Z April Challenge, we only have six more sleeps til the grand finale next Saturday when our all stops journey through the alphabet finally comes to an end for another year. My theme this year is Writing Letters to Dead Poets. This has become quite a philosophical journey as I ask them about the nature of happiness, the role of suffering, advice for young poets and a love of the natural world. My ignorance has been growing my the day! Once again, I’ve posted An Alphabet Soup Post listing links through to posts A-T. Since starting Letters to Dead Poets, I’ve retreated into my cave and switched off from the outside world as much as is possible being married with two kids on school holidays and two dogs desperate for walks at the beach. Indeed, I’ve just returned with two pooped pooches from the beach. Nothing like chasing the ball and running round with other dogs. Heaven help me if I show any sign of going out! I was lucky not to be wiped out in the stampede. On Friday night Geoff and I went out for dinner at a Mexican restaurant on the local waterfront. The kids were staying with my parents for a few days and it was great to be able to kick back and converse. After not leaving the house for a few days immersed in my writing, I also needed to be pulled away. Do something else. Look beyond the screen and the four walls around me. Walking back to the car, we were stopped in our tracks. A huge cloudy galleon hovered over the beach, silhouetted by the full moon. Mesmerised, we stared in awe and dashed home to get the camera and tripod. By the time we came back, the clouds had changed and weren’t quite as breathtaking but the photos were still impressive. Geoff took most of them. He is much more technically adept than me and also has a excellent eye. We are both keen amateurs. We also spotted this very ambitious spider building its web across our backyard by night. It’s been dubbed “Bob the Builder” and “Luke Skywalker”. I guess you could say things have been quiet when photographing spiders is one of the highlights of the week. That is aside from writing. Tomorrow , will be ANZAC Day here in Australia. The 25th April commemorates the landing of Australian and New Zealand troops at Gallipoli, Turkey, during WWI. Geoff’s Great Uncle served at Gallipoli and his mother’s cousin served at Kokoda. The kids will be marching locally with their Scout Troop. How has your week been? I hope things have gone well. The Weekend Coffee Share is hosted by Part Time Monster and I encourage you to pop over for a cuppa via the “Linkup Linky“. This entry was posted in Photography, Poetry and tagged #atozchallenge, #weekendcoffeeshare, ANZAC Day, books, parenting, philosophy, poems, poet, poetry, psychology, reading, Shakespeare, writing on April 24, 2016 by Rowena. Terror in Australis: the Siege in Sydney’s Martin Place. Today, it’s 9 days before Christmas and our Christmas tree is standing in a plastic bucket of water almost naked awaiting decorations. We’ve had a very busy weekend with our daughter’s dance concert and I played my violin at the school Christmas carols and we also had to get the decorations out of storage.Oh yes, our son and I made our Christmas cake as well. To be honest, we’ve almost been too busy for Christmas! Tonight was going to be the night. Being a bit of a flamboyant type, I usually like to turn decorating the Christmas tree into something of a ceremony with some Christmas cake, mince pies while the sounds of Hark the Herald Angels Sing echo throughout the house. Our decorations are an eclectic mix accumulated over the years and include snowmen and coloured-in Christmas stencils the kids have done over the years. However, how can we possibly dress our Christmas tree tonight while hostages are still being held captive in a siege at the Lindt Cafe in Sydney’s Martin Place? They’ve now been held captive for over 11 hours. We all know the impatience of being stuck in a queue for more than 5 minutes and the fear of being trapped in a lift for any length of time and none of these horrors even comes close to the psychological and emotional trauma of being held captive by a gunman and it’s pretty safe to assume that someone who would take people hostage in the first place might not be the most stable of characters. 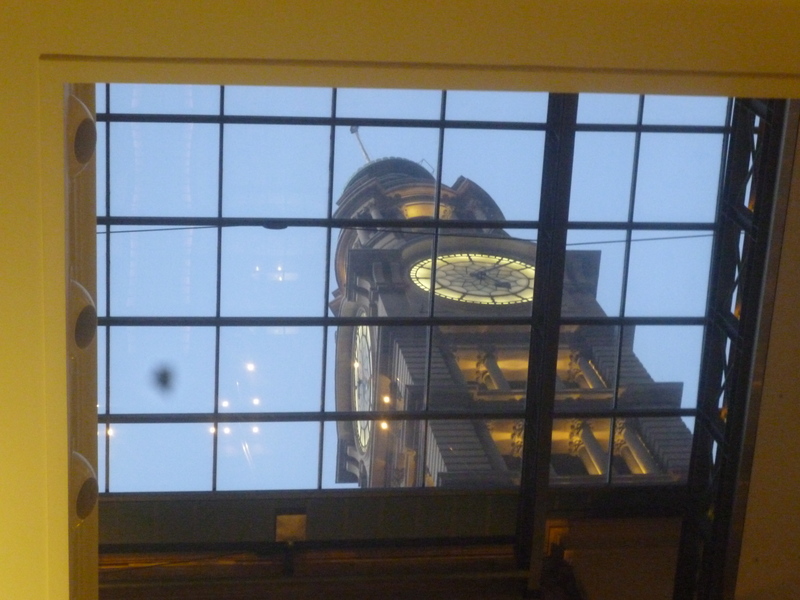 Clock Tower, Sydney GPO, Martin Place. However, the tide stops for no one and so we went ahead with decorating the tree although instead of the usual Christmas cheer, we were watching the rolling news coverage instead. So much for Christmas carols and a bit of Christmas cheer but there are bigger things at stake. 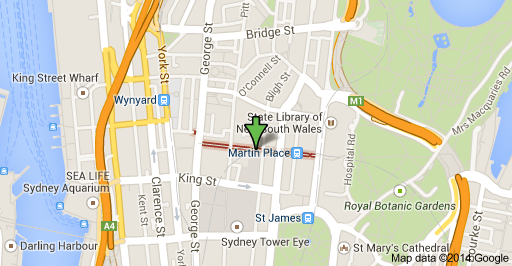 However, as you might not have heard of Martin Place, I thought I’d provide something of a back story. After all, you would think that the Sydney Harbour Bridge or the Sydney Opera House would be more likely choices for a siege but once you look around Martin Place a bit, the thinking becomes clearer. Map Showing the location of Martin Place, Sydney. 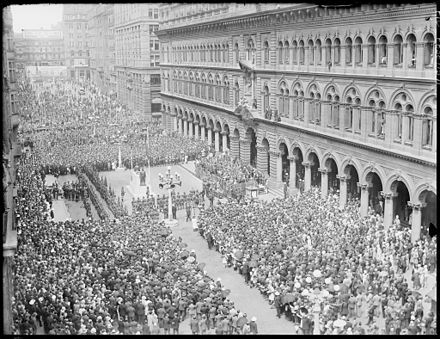 Martin Place was officially opened in September 1892 and was named after the Chief Justice, Sir James Martin, a former New South Wales Attorney-General and Premier. Moore Street (between Pitt and Castlereagh streets) was widened and renamed Martin Place in 1921. 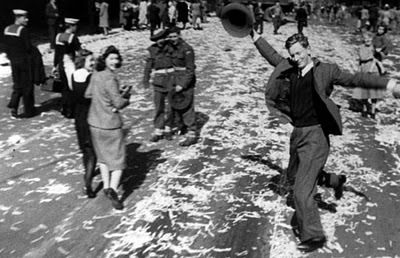 Celebration in Martin Place: This iconic photo known as “Dancing Man” was taken in Elizabeth Street, Martin Place where this exuberant gentleman is celebrating the end of WWII on 15 August, 1945. “Martin Place has been called ‘the heart of the city’, and it was added to the Australian Heritage Commission’s list in 1989. 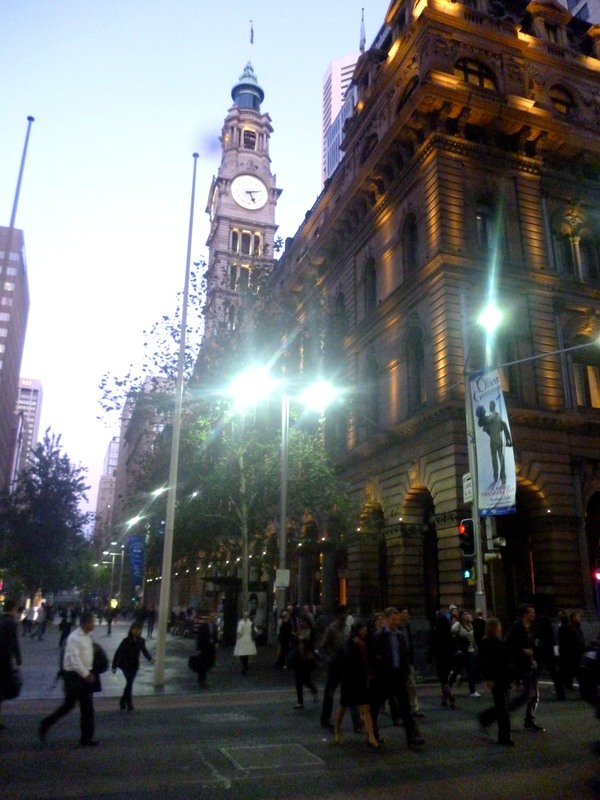 It is the site of the Cenotaph, built in 1927, and some of Sydney’s finest buildings front it, including the GPO, two Commonwealth Bank buildings, Challis House, the Australasia Bank head office, the Colonial Mutual Life building and the APA building. Martin Place was also the site of the spectacular but now demolished Hotel Australia and the Rural Bank head office. It is home to the head offices of the Reserve Bank and a number of other banks. Personally, I think of Martin Place as a quiet place of reflection where you can take a bit of time out from work while eating takeaway or perhaps a sandwich and there’s always a large contingent of pigeons.Come rush hour, there’s also the rush and bustle and Martin Place transforms into a sea of rapidly moving legs. It’s a great place to go people watching. Take photos and feel completely immersed in Sydney. 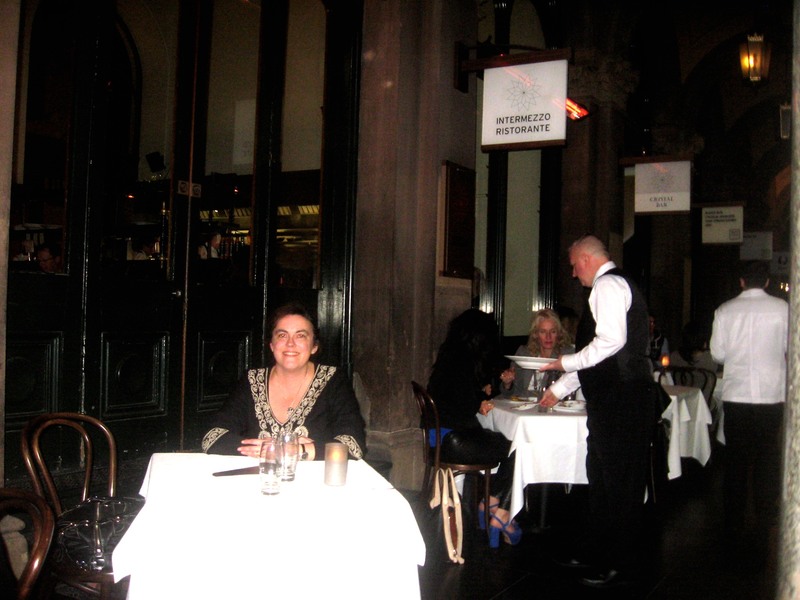 Here I am dining out in Martin Place after attending the Sydney Writer’s Festival last year. Quite aside from its Martin Place location, the siege is in the luxurious Lindt Cafe. I’ve never actually been there myself but friends have. It’s the sort of place you go for that special indulgence and in so many instances, sharing the chocolate you love with the person you love. Lindt chocolate is absolutely divine and to be perfectly honest, many of us would have fantasized about being accidentally locked in Lindtland with all that chocolate. Obviously those chocoholic fantasies are a very different scenerario to what’s now going on at the Lindt Cafe. One minute, the hostages were in heaven, the next minute they were in hell. This siege is like having a bullet shot into Australia’s heart and it hurts. It bewilders. We can’t understand why something this awful is happening here. Our innocence, our naivety perhaps, that these things might happen overseas but do not happen here, has been shattered. Nowhere is safe. Traditionally, Australia has been geographically isolated from “trouble”. World War I never reached our shores and while the Japanese dropped bombs around the Australian coast notably in Sydney Harbour and Darwin, the war was largely waged on foreign soil. Intellectuals, writers, artists, performers have all lamented this isolation and have often fled our shores either by necessity or design. We were something of a backwater but the world has shrunk and we can no longer depend on this isolation. We are now part of the world wide web. We can’t turn back..whether we want to or not. It is now more than 12 hours since the siege began and it’s hard to believe that there is no end in sight. It is shuddering to think about what the hostages are going through…as well as their family and friends. I know that anguish of living in suspended animation and the thought of being taken away from those I love and who love me…even though I’ve never been in a hostage situation. That is anguish and we’ve seen a few of the hostages who escaped on TV and their terror is chilling. We pray for the peaceful resolution and for the safe release of the hostages and for healing from this anguish. I am also praying about the repercussions of this event. People are angry, scared. We’ve had our very way of life threatened and it’s only natural to fight back and defend you and yours as well as your beliefs. We do not want terrorism or violence of any sort in our country and while we do need to defend our country from internal and external attack, we also need to nurture a culture of love and acceptance where people of all cultures and creeds feel at home. That said, extremism of any sort needs to be dealt with strongly so we can continue living in a free and just people. I am hoping to wake up in the morning and hear that the siege is over. That it has ended well. My goodness. I am now heading off to sleep in my own bed while the hostages and sleeping or more likely spending the night with a gun point at them. Reminds me not to take things for granted and to be thankful, even though I’ve had a run of bad luck lately. I send them, their family and friends my love. This entry was posted in Sydney Postcards and tagged ANZAC Day, Australia, Australian History, carols, cenataph, chocolate, Christmas, Christmas tree, family, freedom, grief, history, Lindt Cafe, Lindt Cafe Siege, love, Martin Place, PTSD, racism, Sydney, terrorism, trauma, WWI, WWII on December 15, 2014 by Rowena. ANZAC Day commemorates not only the first landing of Australian and New Zealand troops or ANZACS at ANZAC Cove, Gallipoli on the 25th April 1914 but also honours service people who have served in all of our wars. I didn’t really grow up with this sense that my family had served in the war even though my Great Uncle Jack had served in New Guinea in World War II and my grandfather had served as an Army Captain within Australia. Geoff, on the other hand, grew up with two uncles who had served in New Guinea and another who had served in Darwin and his Nanna who had lost a brother in France during World War I. Last year, we also found out that his father’s uncle had served at Gallipoli and went on to be part of the charge at Beersheba. So when it comes to ANZAC Day, our family has something personal and close to home to honour and respect. We have also seen the longer term impact of war on wives and children who experienced alcoholism, violence and depression. Not because they were bad men but because they had seen and experienced horrors that no one should experience and then they were simply sent home. 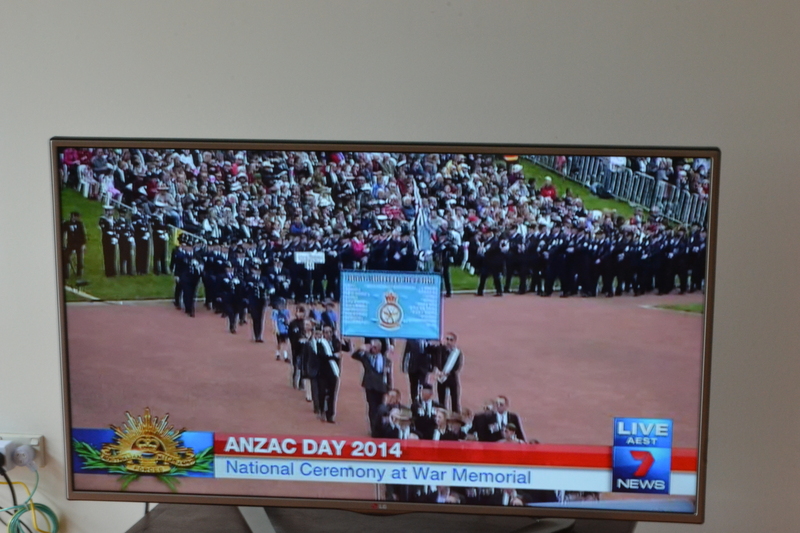 Geoff and I have been into the ANZAC Day march in the city only once but every year since I can remember, I have always watched the march on TV. In some respects, it is a solemn occasion where we remember and honour the dead but there is also so much to look at and I have always felt such a love and a fondness for the old men marching with their medals pinned to their hearts. I remember when these old men had been to WWI and slowly and surely they became the faces of World War II veterans and now even the Vietnam Veterans are looking well…old…and the WWI diggers have gone and WWII ones are thinning out. Along with watching the march on TV, I have another time honoured tradition…making ANZAC Biscuits. Mothers, wives, girlfriends and anyone who cared, baked ANZAC Biscuits at home and sent them overseas to the men at the front. Such packages and letters from home were treasured, providing a much needed connection with their loved ones at home as well as breaking the monotony of military food. Not unsurprisingly, making ANZAC Biscuits on ANZAC Day is as tradtional as the official Dawn Service and the march. ANZAC Biscuits are really just an oatmeal biscuit and by modern standards are pretty plain. You can jazz them up with chopped nuts, ginger or even choc chips but for ANZAC Day, I always keep them plain and authentic. Their simplicity also serves to remind us of simpler times when austerity measures had been implemented, rationing had been in place and there wasn’t our modern over-abundance of just about everything. Things were scarce…even the basics like eggs. Despite their simplicity, ANZAC Biscuits with their dose of thick, sticky, sugary golden syrup are scrumptious. If you are a connoisseur of ANZAC Biscuits and as strange as it may seem, these people do exist, you need to specify whether you like your ANZACS soft or hard, very much the same way people get quite picky about having their fried egg: “sunny side up”. Personally, I have had great difficulty mastering the perfect ANZAC. Most of the time, I find the mixture doesn’t come together well and I’ve needed to add extra butter to bind it together. Moreover, as I only really make ANZACS once maybe twice a year, I haven’t managed to perfect the process and work out quite what makes them crunchy or chewy. We just get what we get and usually because I’m baking them with the kids, I’m just thankful for that. If you have read my blog before, you will know that most of my cooking efforts with the kids have their dramas and I must admit that I’ve had a good think about why we have the kitchen of chaos instead of something approaching the scientific wonder of the Australian Women’s Weekly Test Kitchen. I mean, you can be sure that most of our antics could never be replicated by anybody anywhere no matter how hard they tried. As usual, baking ANZAC Biscuits failed to disappoint and we had our usual range of hiccups. 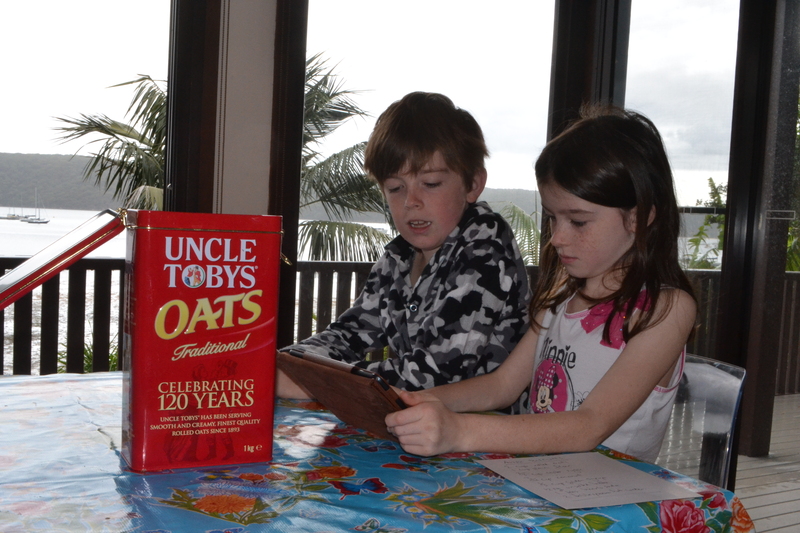 The kids play games on the ipad waiting for the tin of oats to magically refill. The first thing that you have to keep in mind when baking ANZAC Biscuits, especially if you like me want to bake them while watching the march, is that you need to check that you have all your ingredients the day before because the shops are shut on ANZAC Day until after lunch. This is a very important word of warning and despite my best efforts, I keep getting caught. This year, we are staying at my parents’ house at the beach and it is not very well stocked so I brought everything with me including the metal biscuit tray. However, I’d brought everything except the main ingredient…the oats…because I’d bought this wonderful metal tin put out by Uncle Toby’s specifically to house your big box of oats and to keep the nasties out. Thinking I had about a 12 month supply, much to my horror, I didn’t check my supplies. The tin was completely empty without so much as a single oat left inside. Some horrific porridge-guzzling Goldilocks and her three bears had been guzzling my oats. I scoured the cupboards optimistically. Dad has his very healthy whole grain oat porridge “stuff” which looks like oats on the outside but also has other grains mixed in and as tempted as I was to use this instead, Geoff and I both agreed it was a bit of a gamble. We were all looking forward to our annual ANZAC Day indulgence and we didn’t want a “fail”. We had to wait. So we watched the march and while waiting for the shops to open, we took the dog off for a walk along the mud flats and the kids and I squirted Neptune’s Beads at each other and at ourselves and had a bit of fun. It had rained heavily overnight and it was still overcast so not terribly pretty but it was fun sloshing through the mud even if we didn’t see any crabs. Miss, I must say was thrilled about that. She doesn’t like crabs. She doesn’t like them at all and the mud flats down here start crawling as thousands of them emerge out of their holes at certain times of day which as yet I haven’t managed to pin down. By the time Geoff returned from the shops and I’d had a bit of a nap, it was late afternoon by the time we were making the ANZACS and beforehand we quickly whizzed up our pizza dough for dinner and set it aside to rise. 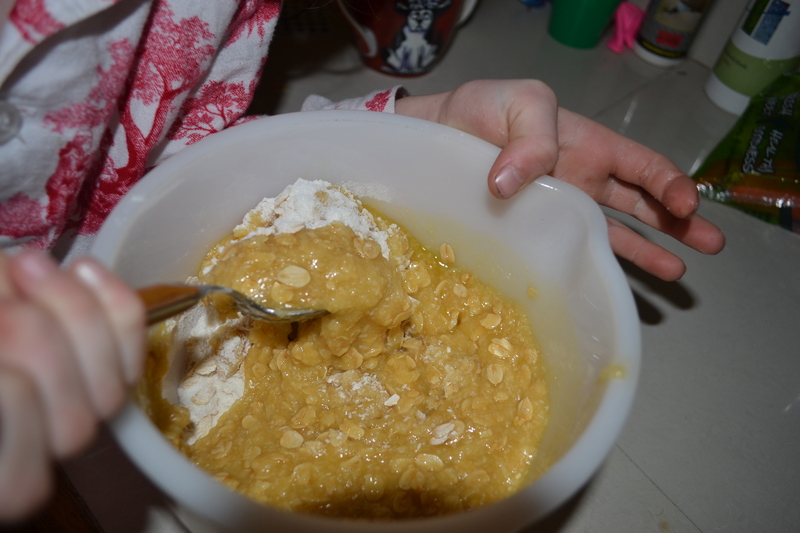 When it came to mixing the dry ingredients, which I’d thought was relatively simple, even this proved challenging to the kids and I could feel my patience getting very thin, very thin indeed. When you are pouring a cup full of flour as an adult, or at least an adult who has been cooking all of your life, you just know where that magic, unwritten line is on a cup that measures a cup full of something. It’s not ¾ of a cup and it’s not a cup full with some kind of mountain peak stuck on top of it either. It’s a full cup with something like a finger space left empty at the top so your supposedly full cup of whatever, doesn’t spill. I’m sure it is actually possible to pour a cup full of something without spilling it on the bench too but I’m not sure if I’ve even pulled this one off. We’re all a bit careless around here. I think that sank in although with kids you never know. I’d swear they have what my grandfather used to call “good forgettery” before his Alzheimer’s set in. So after that very lengthy preamble, here is the recipe for ANZAC Biscuits. When we made it today, it produced a chewy, rather than crunchy biscuit and it was truly delicious! 3) Take a small to medium saucepan. Measure out golden syrup using either a cup of measuring spoons. I actually have a series of cup measures and that’s ideal for measuring out the golden syrup. Being so thick and sticky, it’s not the easiest to measure out. Add butter. We always buy the 250g packets of butter for cooking and I have noticed that even when the kids do a relatively simple thing like cutting the butter in half, they usually push the knife through at a not insignificant angle which can significantly alter the quantity of butter. Of course, you can take more of a laissez-faire approach with the kids and have fun and it doesn’t matter how it turns out but that’s not teaching your kids how to cook. I do quite a lot of ad hoc cooking myself and rarely follow a recipe to a T but I have enough experience and instinct to be able to cook by feel. I generally know what the mixture is supposed to look like despite what the recipe says and will jiggle ingredients around until it looks right. That sounds like I am contradicting myself but it does make sense. 4) Place saucepan on the hotplate at a medium to high heat stirring occasionally. It doesn’t need to be watched closely but don’t walk away either. Depending on the age and capabilities of your kids, decide yourself whether to let them manage the hot aspects of the recipe. 5) While the butter and golden syrup are melting, you need to prepare the bicarb soda and water mix, which is what enables the biscuits to rise and I’ve always felt the way the melted butter and golden syrup mix rushes up like a volcano provides great entertainment. I remember my Mum introducing me to this mystery as a kid and I was in awe. It was absolutely fabulous. 6) Remove golden syrup and butter mix from the stove. Have the bowl of dry ingredients nearby and add the bi-carb soda and add water mix to the saucepan. This can really froth up and get quite excited so you might have to move quickly to avoid spills. This is a job for big hands or kids aged 12+ considering the hot, sugary fat involved. 7) Mix well. You might need to add extra butter to get the ingredients to mix together well. You don’t want the biscuits to be too greasy but the mixture also needs to hold together well without crumbling. We ended up grabbing handfuls of mixture and squishing it together a few times to shape flattened balls which stayed together. I don’t think I’ve had to do that with recipes I’ve made in the past but they had been more of a crunchy consistency where these biscuits were more chewy. 8) Cover a metal biscuit tray in non-stick baking paper. In the past I’ve placed spoonfuls of mixture onto the tray but with this recipe, I needed to squish the mixture together a bit for it to hold together. You need to leave a bit of space between each biscuit to allow for expansion. 9) Bake for 8-10 mins or until golden. Remove from oven. Leave on tray to cool down for 5 minutes then transfer to a wire rack to cool completely. Simple and scrumptious and we can remember our fallen heroes as well! My two little mini chefs. This entry was posted in Baking, Kids learn to Cook, Recipes, Uncategorized and tagged ANZAC Biscuits, ANZAC Day, baking, burns, cooking with kids, Gallipoli, loss, love, mom, mum, Oatmeal Cookies, parenting, safety on April 25, 2014 by Rowena. Although ANZAC stands for Australia New Zealand Army Corps, it has become a word in its own right and has even become a biscuit. ANZAC Day is held on the 25th April and commemorates the landing of Australian and New Zealand troops in Gallipoli in 1915. Today, my daughter and I did what Australians have been doing on ANZAC Day ever since the the First World War…we baked ANZAC Biscuits together. I have been baking ANZAC Biscuits on ANZAC Day since I was a little girl and I still remember my wonder when we mixed the bi-carb of soda and water together and it all frothed up. It was like magic. Wow! 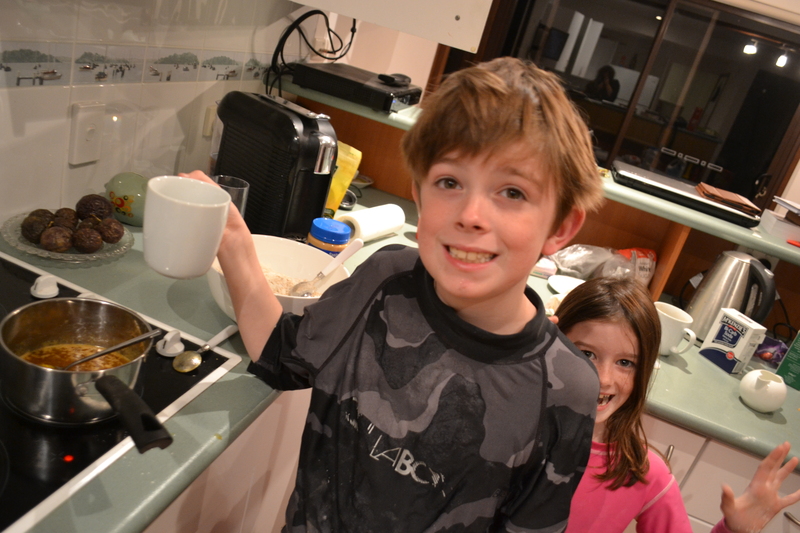 When my son was smaller, we made ANZAC Biscuits together. For some reason he used to call oats “notes” and so these became “Note Biscuits”, which sounded incredibly cute. It still makes me chuckle. Today, I made the ANZACs with my 7 year old daughter. Where we’d usually make them for morning tea and eat them while watching the march on TV, today we made them at dinner time and had them for dessert. I had spent much of today researching family members’ war time service and had some truly amazing discoveries which pretty much kept me occupied for the day. That will be a separate post. Miss stirring the ANZACs. We spent the day in our pyjamas. When you read about me baking ANZAC Biscuits with my daughter, it sounds like one of those really sicky-sweet mother-daughter moments you’d expect to see on something like the Brady Bunch. That wasn’t our mother-daughter moment. We were making the ANZAC Biscuits while I was cooking dinner which really was setting us up to fail. I don’t multi-task well and really struggle to do two things at once. Miss was also a bit tired and fidgety. She struggles to follow instructions at the best of times and as we’ve already established, this wasn’t the best of times. We were cooking under pressure. Miss doesn’t understand the need for recipes and has actually made half-decent cakes or “mixtures” completely from scratch. While that might work for her, it makes for some stressful moments when it comes to cooking something specific together. By now, you can probably already sense the storm clouds were brewing. There wasn’t a huge storm. Nothing like the clash of the Titans but our cooking experience certainly wasn’t going according to plan and I was becoming a little grumpy. The recipe says that making ANZAC Biscuits is easy but I’d forgotten to take my usual handful of tablets this morning and was starting to keel over. My brain was foggy and yes, I’ll blame the tablets but I stuck the butter in the microwave without thinking and remembering this needs to go in a saucepan and be melted properly on a hotplate. You also need to have the dry ingredients in the bowl first. In other words, you need to stick to the recipe. Follow the recipe step-by-step. Pretty Simple Simon, isn’t it? Only, I’m no Simple Simon. The ANZAC BIscuits weren’t the best ones I’ve ever made but we did it. We paid our respects to our fallen heroes and I am also even more mindful of those who returned back home and in the words of Veteran and actor Bud Tingle “they were never quite the same”. So today, we honoured ANZAC Day. Perhaps, you would like to join us in a biscuit and a cuppa! This recipe comes from the Australian Women’s Weekly. Preheat oven to 160°C or 140°C fan-forced. Combine all dry ingredients except bi-carb soda in a large mixing bowl. Combine butter and syrup in a small saucepan. Heat gently until butter and syrup melt. Combine bicarbonate of soda and water in a small bowl and stir into butter mixture. Combine remaining ingredients in a large bowl. Pour over warm butter mixture and stir well to combine. Roll rounded teaspoons of mixture into balls. Place about 4 cm apart on baking paper lined baking trays and flatten slightly. You can also be a bit more decadent and make a few large biscuits if you so desire. Bake in preheated oven 12-15 minutes or until golden brown. Remove from oven and cool 5 minutes on baking trays; transfer to a wire rack to finish cooling. 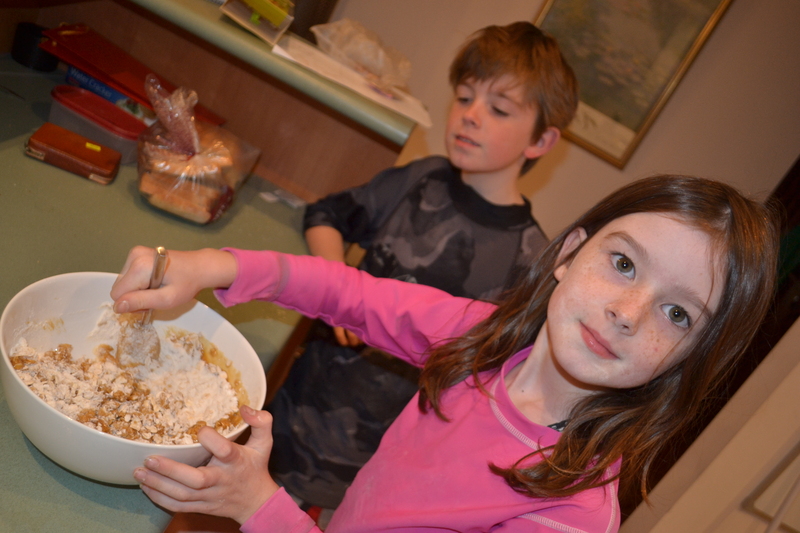 This entry was posted in Baking, Kids learn to Cook, Parenting, Recipes, Uncategorized and tagged ANZAC Biscuits, ANZAC Day, baking, biscuits, family, love, mom, mum, parenting, traditions on April 25, 2013 by Rowena.